There are few domestic tasks that require more knowledge and skills than others. You either have to be a professional or at least to know how to clean your sofa effectively. Here are the tips that will ease your sofa cleaning. The key to cleaning the sofa effectively is regular and preventive care. When you buy a sofa, you should be responsible for it. This means that you should clean it, or seek professional help if you lack the skills. You can learn a lot when you hire professionals and watch how they handle the sofa cleaning process. It seems easy when someone else is doing it for you. If you cannot afford to use such services, watch a video. Some interesting things are easy to notice. First, cleaners do not start cleaning right up. They touch the fabric to be able to pick the right cleaning method and products. Experts do this, why don’t you? When you know what you are cleaning, then you know how to do it effectively. Dry clean only fabrics are the hardest to maintain. We are into the habit of rinsing and rubbing, but clothes and garments are not that expensive, are they? So whenever you are faced with an unknown stain, try brushing it. Nylon-based fabrics are the easiest to clean. You can just scrape the stain away. But when liquids are spilled, dry sofa cleaning will be required. Do not let the sofa absorb the spillage. Gently blot, no pressure should be applied. Clean the sofa as if you are taking care of your own skin. 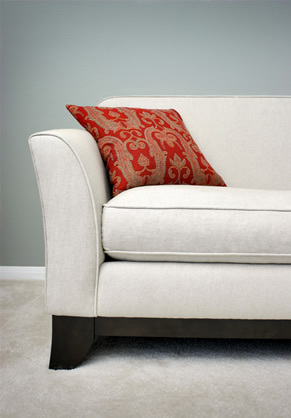 The sofa fabric interacts with your body, that’s why it should be clean, dust free, or, in other words, healthy. Once you know the basics you can improve your sofa cleaning skills even further.